Good location, nice staff and super friendly place. Would definitely stay here again. Its my go to hostel when I am in Auckland. Central location, clean, comfortable beds and strong hot showers (and hairdryers). The staff are friendly and helpful. Good, spacious well equipped kitchen. Great place, really conveniently located with friendly staff and a great kitchen. Very comfortable and welcoming! Great kitchen/porch area for hanging out. Right downtown, and just around the corner from InterCity bus — very convenient! Would definitely stay here again any time I'm in Auckland. Great location, friendly staff, perfect for a night stop over! I stayed in 4 bed female dorm room-quiet and clean. Bathrooms were clean, nice hot showers, hair dryer provided ! Good security - code to get in the hostel, locker rooms and locks on rooms. The kitchen was AMAZING with all the spices you’d ever need. Excellent security with multiple locked doors between you and the outside at night. Lockers available if you have a lock. 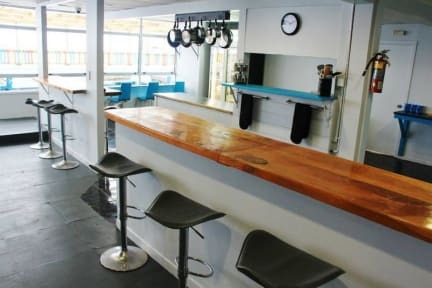 great hostel, with a great atmosphere and also in a nice location in central Auckland. One downside is that the rooms don't automatically lock when you close the door. This results in the doors basically always being unlocked. Miserable reception staff. I checked out 35 mins late which is fair enough my fault because I slept in, but keeping my $20 key deposit is shocking. I’ve been backpacking for many years and stayed in a lot of backpackers but the girls at the reception at the attic shouldn’t be working there. Bad vibe , unfriendly , rip off. Very disappointed and won’t be back .